The conference will take place at the City University of New York (CUNY) Graduate Center in Midtown Manhattan. Read more about the program. Single-day registration is now available for $180 per day. The on-site food package and the tickets to the State of Liberty and Ellis Island are no longer be available. We closed these purchases in advance of the conference because they both require advanced preparations. You can still purchase participation in the Sunday Social event, but it will not include tickets for the boat tours (only lunch). Click on the "Register Now" button to register for the conference and to purchase passes for meals and special events. Attention, WAPCEPC members! Enter the promo code member on the LAST PAGE of checkout in order to receive discounted pricing. To see the registration process step-by-step, please view this video. You may pay by credit card or with a PayPal account. *Please print out your tickets and bring them with you. If you forget to bring your tickets, you can print them out during on-site registration. 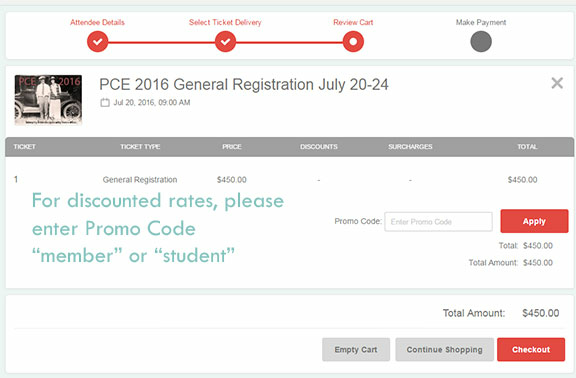 Registration includes access to all PCE 2016 events from July 20, 2016 through July 24, 2016, including presentations, workshops, roundtable discussions and encounter groups. The 3 day on-site breakfast and lunch package includes a continental breakfast and a buffet lunch located at the CUNY Graduate Center on Thursday through Saturday, July 21-23, 2016. Vegetarian options are available. Please be aware our actual costs are higher, but we are subsidizing this food package to help make it more affordable. *We recommend the 3 Day On-Site Food Package for those who would like the ability to maximize their conference attendance, as pursuing other meal options in Midtown Manhattan can be time-consuming. At this time we are proud to announce our main social event will be a sightseeing boat and land tour of the Statue of Liberty and Ellis Island. This tour will depart from Lower Manhattan (bpca.ny.gov) on Sunday morning, July 24, 2016, at 8:30am. . Following these tours, at 11:30am, there will be an open air picnic in a Battery Park City, just to the left of the tour dock exit. The picnic site will offer amazing views of the Statue of Liberty as well as New York Harbor, and will be a wonderful way to close the conference in a relaxed and personal picnic setting. The deadline for cancellations was January 15, 2016. No refunds are available after January 16, 2016. La Jolla Program (July 24-27, 2016) - CANCELED AS OF 6/28/16. Notice: This page was updated on July 1, 2016. Please consider joining Person-Centered & Experiential North America. The mission of this organization is to promote Person-Centered and Experiential Psychotherapy and Counseling approaches within North America. All North American countries, dependencies, and territories are embraced in this organization.